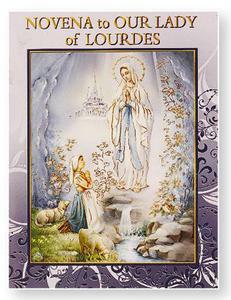 CATHOLIC GIFT SHOP LTD - Our Lady of Lourdes Novena Booklet with Apparition Dates. Our Lady of Lourdes Novena Booklet with Apparition Dates. Paperback Our Lady of Lourdes novena booklet with beautiful Italian artwork thorough the book. 24 pages measures 4" x 5 1/2"